Food served Mon–Thu noon–10pm; Fri/Sat noon–11pm; Sun 12.30–10pm. This beautiful old bank’s currency is now Japanese food, like bento boxes, sushi, noodles and imported drinks. With its stylish venue and good-looking food, Nippon hits the sweet spot between classy and casual. 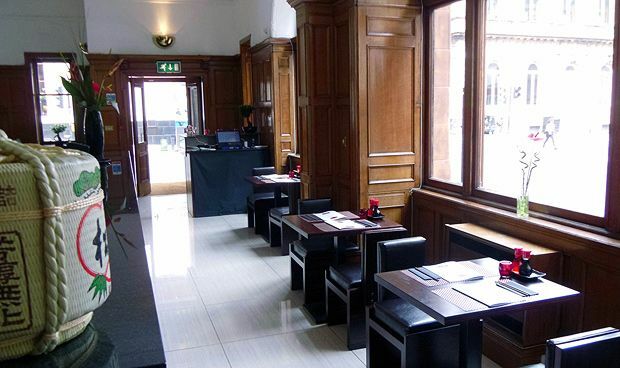 The classic Glaswegian architectural features of the high-ceilinged old bank building clash a little with the restaurant’s Japanese furnishings, such as quirky illustrations, cute sculptures and paper lanterns. Nevertheless, it seems to attract plenty of office workers and shoppers. The massive menu offers oodles of sushi and sashimi, though there is plenty else to choose from such as rice dishes, teppanyaki-grilled meat or seafood, bento boxes or big steaming piles of noodles. Starters include dishes such as skewers of chicken coated in thick, sticky teriyaki sauce, or sweet potatoes and courgettes in tempura batter. For mains, try the fried ramen noodles in a light ginger sauce topped with a whole, crispy duck breast – the lightness of the noodles combine with the rich duck breast and crunchy vegetables to make a delicious combination. The drinks menu deserves shelling out for – the red rice ale is pretty special, the cocktails look stylish, and the Japanese whisky is a must-try for any lover of uisge-beatha.